It seems that just about everyone is afraid of something. There are some fears that we’ve all heard of, like claustrophobia, the fear of being in confined spaces. But there are a lot of phobias that quite likely you’ve never heard of before. For example, have you ever heard of acrophobia, a fear of heights? I think I have that one. I climb up a ladder, and my stomach feels queasy and my legs start shaking. Or, have you ever heard of mysophobia, a fear of germs? Donald Trump, for instance, is said to have this fear, to the point that he does not shake hands with anyone. Or have you heard rhytiphobia? That’s the fear of getting wrinkles. Or how about arachibutyrophobia? That’s the fear of getting peanut butter stuck to the roof of your mouth. Or if you see someone who looks panicked in the next few minutes, it might be because of homilophobia, which is a fear of sermons. I want to suggest to you that this story of Adam and Eve in the Garden of Eden, is most basically a story about fear. Now I imagine some of you are thinking to yourselves, “Fear? Everyone knows that the story about Adam and Eve is a story about sin. It’s a story about how the devil came along and goaded the first two people into doing what was wrong.” One of the problems with a story like this one is that we’re so familiar with it, we’re so sure that we know what the story is saying, that we end up not really hearing the story the way the Bible tells it. One example is how we assume that the talking snake in this story is the devil. But if you re-read the story in the Bible, you discover that nowhere does it say or suggest that the serpent was the devil. Yes, the serpent is introduced as being “crafty,” and yes, the serpent talks, which is really weird; but in the same breath the Bible says that the serpent was one of the wild animals that the Lord God had made. Yes, it’s a little weird that the snake can talk, but it’s not the only story in the bible of an animal that talks. And so, Eve has a conversation with this crafty, talking snake. The serpent is playing on their fears. ‘Are you sure God knows what’s best for you? What are you missing out on? What is God holding back from you? So this story is a story about fear. It’s a story about how that serpent, by asking a few simple questions, led Adam and Eve to demonstrate just how much fear they had in their lives. So, what is it that causes us to fear? Most basically, we fear what we don’t trust. A professor at Arizona State University did an interesting experiment. He had students sit at tables in pairs. And at each table there was a bowl full of nuts. And the professor announced that the goal was to get as many nuts as you could. But there was a twist. Every 10 seconds, he said, someone would come and double the number of nuts that were still in the bowl. Obviously, then, the best strategy would be for both people at the table to just sit there and not take any nuts, so that the number would be doubled. But about 2/3 of the time, the participants immediately grabbed for the nuts, leaving the bowl empty before even the first 10-second period had passed. That experiment shows what happens when we don’t have trust. If the people at each table would have trusted each other, they would have just sat there and allowed their bowl of nuts to keep getting doubled and doubled. But if I don’t trust you, I end up figuring that the only choice I have is to start grabbing things for myself and doing what I think is best for me. Isn’t that essentially what happened there in the Garden of Eden? Adam and Eve lost their trust in God, and so they resorted to grabbing that forbidden fruit, doing what they figured was in their own best interest. I guess you could say it all started when the serpent got them thinking, “Hey, why is it that God won’t let us eat from that tree over there, that tree of the knowledge of good and evil? What is God holding back from us? And so where Adam and Eve went wrong was that they failed to trust God. Instead of trusting that God had some good reason for them not to eat from that tree and trusting that God had their best interest in mind, they came to the conclusion that God couldn’t be trusted. And so they felt they had no choice but to take matters into their own hands. And if you look at all the different sins that are eventually described in the Bible, they basically boil down to that same lack of trust in God. Look at the Ten Commandments. The first commandments says: ‘You shall have no other gods.’ Why would anyone have other gods, and worship money, or celebrities, or make something else their highest goal in life, unless they had lost their trust in God? Or the commandments against murder, adultery, and stealing: If we lose our trust that God is going to provide for our daily bread and for all the other needs that we have, we end up figuring that taking from others to get what we need is the only option we have. Adam and Eve were sorry for their sin. This is what is meant when we read that they saw their nakedness – it’s a metaphor – they saw their need before God, that they were sinners in need of God’s grace. And grace they would receive. We read, a few verses beyond our reading this morning, that “God made garments for them, and clothed them.” (3:21) God loved them; God did not abandon them; God continued to be involved in their lives. But there were consequences to the choices they made. And they would have to live with that. In the end, we discover that life is not something we can reach out and take for ourselves. Rather the only thing we can do is stand before God and trust; trust that life – its meaning, its purpose, its joy, and its fulfillment – is something that only God can give to us. Today we baptize Corban, and in doing so, we also remember our own baptisms. Baptism is about trust. 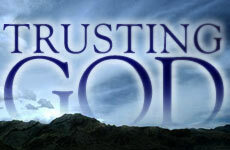 We trust that God loves us, that God takes us for his very own, that God has our best interests in mind. We remember that we are baptized children of God, and we practice putting our lives into God’s hands. Through this story of Adam and Eve, we hear this simple invitation: Put your trust in God.